Can you feel it? Love is in the air! In a couple of weeks, it will be Valentine’s Day, and we want to celebrate with you. 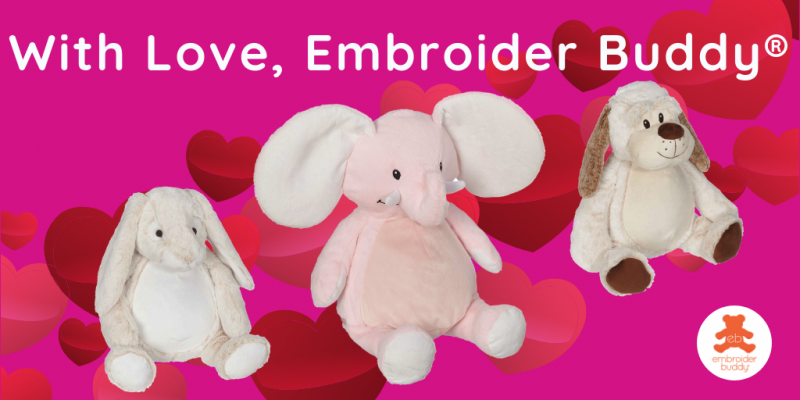 We love Valentine’s Day here at Embroider Buddy® because it’s the perfect opportunity to show how much you care about and appreciate all the special people in your life. There’s no better love than puppy love – Pauley Puppy Dog Buddy, Buster Bulldog Buddy, Dalton Buddy Dog (16” or 22”) and Parker Pug Buddy agree! 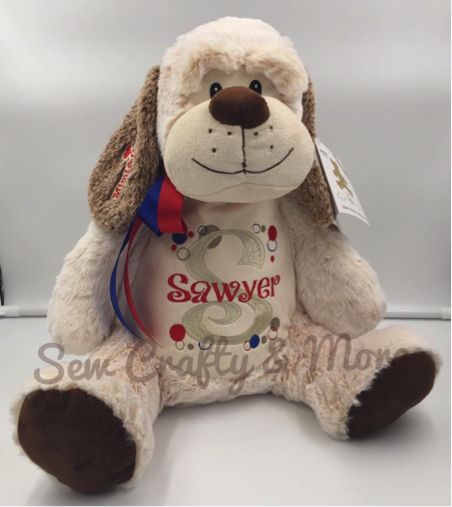 These pups are as cute as can be and exceed all applicable U.S., Canadian, and European safety standards, making them the perfect keepsake for even the littlest loved ones in your life! Pauley Puppy Buddy is also available as a 20” Blankey Buddy and makes everyone feel warm and fuzzy inside! Buddy Bunny and Bella Buddy Bunny – who is available in 16” and 22” – are “ear-esistibly” gorgeous and oh so soft! Who better to hop on over with your heartfelt message than these two cuties? 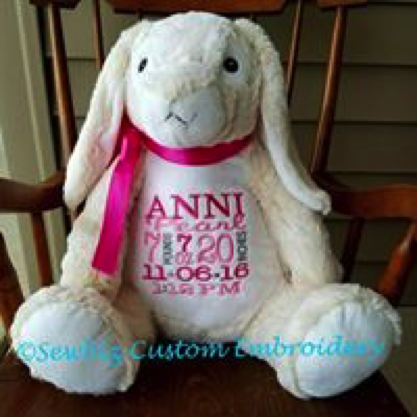 Buddy Bunny also comes as a sweet 20” Blankey, perfect for year-round cuddles. Did you know that most penguin breeds partner-up for life? That’s right, every day is Valentine’s Day for these love birds. Spread the love with Pendrick Penguin Buddy! 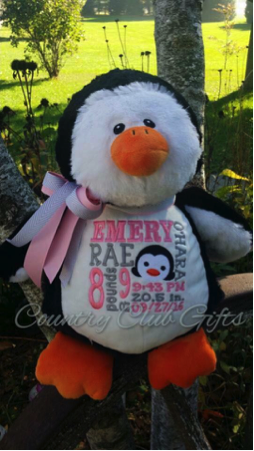 This fuzzy-faced cutie is 16” and is made from embroidery-friendly, low-pile plush fabric. Talk about big love! Our elephant Buddies are the perfect way to say “I love you!” After all, an elephant never forgets, especially when love is involved! These Buddies are 16 inches in height – much smaller than his wild counterparts, who range between eight and thirteen feet tall and can weigh up to 7 tons! 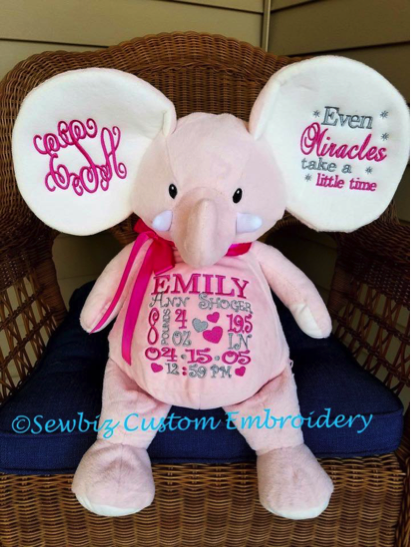 Our more reasonably sized elephant Buddies come with self-contained stuffing pods for the head and belly that are removable through a hidden zipper on their bottoms, making hooping and embroidery easy on any embroidery machine. Check out Elford Elephant Buddy, Elliot Elephant Buddy and sweet Ellie Elephant Buddy. Sometimes it’s hard to find the right words to tell someone just how much they mean to you. Here are a few of our favourite Valentine’s Day sayings that are perfect for every Buddy. Happy soon-to-be Valentine’s Day, everyone! Please share all of your beautiful creations with us on our Facebook Page. We love seeing and sharing your work.